Just in case you’re didn’t believe me when I said I’d be catching some mermaids, a huge fun box of sea creatures arrived at the workroom yesterday. 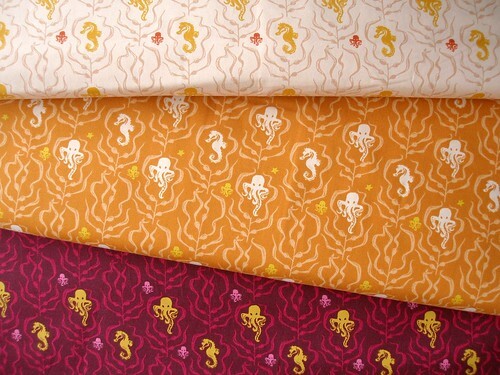 There are seven prints showing fish, sea horses, octopi and pretty mermaids swimming around and lots of fun colourways to choose from. The contest to win a stack of eight fat quarters from the Mendocino mermaid collection by Heather Ross is still on until Friday September 19th midnight. Just go to the original contest posting and leave a comment, telling me your favourite mythical creature and why. There have been so many awesome creatures mentioned already, but I’d love to hear yours! gah! i saw these on purl website before i left and fell in love! i can’t wait to see these in person (maybe this weekend?) and then i can show you the crafty stuff i got in japan. Angelune, you’re back?! Where does the time go! Craziness! K, Save some seahorses for me. They’re my favourite animal of all time! BTW, the mermaid buzz of the workroom is definitely the hype 0f 2008. 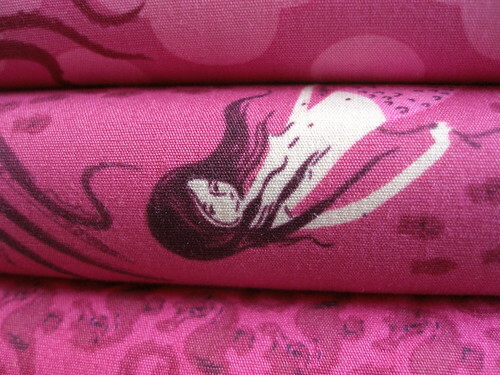 Honestly K, your flickr mermaid page may be the closest thing to “fabricarazzi.” Ridic! nat – of course! i’ll make sure there are some seahorses waiting for you on your next visit! They’re real, all right… REAL FABULOUS!!! Imagine the Sampler Quilt made in the brown, orange, cream and pale link colourways! DELICIOUS!!! It is a rare collection that is heart-thumpingly wonderful. This is one of those collections!!! johanna – i’ve already seen some lovely quilts on flickr with this collection. how the heck do people whip up these quilts so quickly?? ?